The United States Congress designated the Chiricahua Wilderness (map) in 1964 and it now has a total of 87,182 acres. All of this wilderness is located in Arizona and is managed by the Forest Service. More than a century ago the Chiricahua Apache Tribe called the Chiricahua Mountains their own. From here the Apache defended their homeland by launching surprise attacks on U.S. Army troops and pioneer settlements, and here the Chiricahua Apache Indian Reservation stood for a short time. Today, the Wilderness adjoins Chiricahua National Monument, home to some of the most starkly spectacular geology of the southwestern United States. This mountainous realm rises to a climax of 9,797 feet at Chiricahua Peak. Many of the unusual birds that live here are most often seen in Mexico. The terrain supports diverse plant life including Mexican white pine, Apache pine, Chiricahua pine, Douglas-fir, Engelmann spruce, white fir, aspen, juniper, pinion, madrone, and oak. Wildlife includes javelinas, coatis, deer, mountain lion and black bears. Due to dense brush and timber growth, steep elevations, precipitous canyon walls, an undependable water supply few humans venture from the 13 established trails. Trailheads in Rucker Canyon, Turkey Creek and Cave Creek give easy access to the Wilderness, and the Morse Canyon Trail rewards hikers for their efforts with excellent views over some of the roughest country in southeastern Arizona. Evidence of the 1994 Rattlesnake Fire can be seen in many places, and trails are frequently blocked by fire-killed trees that are still falling. Visitors to this wilderness are urged to use caution due to increasing illegal drug and human smuggling activity associated with the international border a few miles away. If suspicious activity is seen move away before attempting to contact authorities. Camping away from trails and water sources is encouraged. 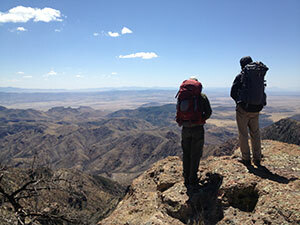 Planning to Visit the Chiricahua Wilderness? How to follow the seven standard Leave No Trace principles differs in different parts of the country (desert vs. Rocky Mountains). Click on any of the principles listed below to learn more about how they apply in the Chiricahua Wilderness.